I’m excited to attend my 3rd conference in as many years. It’s fast becoming a beast of an event. However as overwhelming as our space can be, this conference has always had one theme: the peer experience – most everyone you encounter has been there, done that. 1. Great Scott! – Appreciation goes a long way. I’ve had the pleasure of knowing Scott for several years now and he has been one of the few authentic self-less champions for MarTech. The best way to offer your gratitude is to get a tattoo of this years’ MarTech landscape on your… or a better alternative is buy Scott’s book, “Hacking Marketing: Agile Practices to Make Marketing Smarter, Faster, and More Innovative” for yourself or a colleague and drop by the ION Interactive booth. 2. 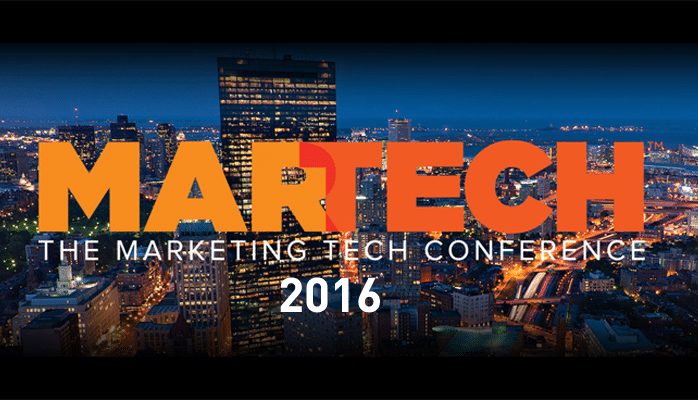 Follow the Conference – @MarTechConf and the thread #MarTech. 4. Subscribe & Schedule Time with Expo Vendors – I know this sounds crazy to give up your email address en masse, but this is a great opportunity to experience the different flavors of marketing at the hands of those who want to engage you. If you do find something interesting, make a marketer happy and schedule time with them at the booth. Believe it or not, the Expo was elbow to elbow last year even during sessions, so get a good conversation, schedule in advance. The conference folks, Third Door Media, has even provided a mechanism to help you connect with the right person. Look for an email if you’re a registered attendee. 5. Attend the fringe events – There is little time to network during the conference unless you skip sessions. So make time to make the most of the receptions and breakfast. During this time, as an attendee ask lots of questions, as a vendor just listen. Also, inevitably on the 22nd, there will be a few after conference watering holes to connect with familiar and new faces. I met nearly a quarter of my most meaningful contacts this way. 6. Journal your takeaways – In whatever form, blog post, emails, doc, etc… try to spend two times a day to journal briefly your takeaway’s from each day’s session to report back to your team or reflect. Sure do the social media thing and tweet cool anecdotes and retweets. To substantively share your reflections through out can inspire new questions and opportunities. If you need another place to get the word out, share your thoughtful posts via #MarTech #Journal. Hey, I’ll read them all if you share them @AnandThaker. 7. Decisions, Decisions, Decisions. – The lens for which have been advising and guiding the next generation of marketing technology is to ask, “How does the solution help me make a decision?”. Operational efficiency and insight are a great start, but ultimately dashboards, reports and predictive algorithms need to prescribe something so that the marketer/sales leader can narrow down the best options for next steps (more on this from me soon). 8. Bring your stack, work toward progress – Its been fun talking about the stacks and who has the ‘best’ stack. However, to my experience your stack represents your organizations DNA. You all uniquely deliver value to your customers not through just technology, but also with your teams and data. Challenges that your ecosystem should have solved for you. Version of what advancement looks like for you. Marketers, including sometimes yours truly, can become victims of the shiny object syndrome. Bringing this list can help you make the most of your time, conversations and follow-up game plan. My ask? Pay it forward. If this is your first time to the conference, expect to be surprised at how many people are experiencing the same challenges as yourself. You may even find you are doing pretty well in certain areas managing your marketing technology and can offer some great advice. Enjoy the conference and help make the peer experience a great one! Any other ideas or hacks to make the most of the conference? What else do you want to know? – Context is next: Are you ready for the next wave in marketing?